Your veterinary hospital in Greeley, Colorado. We provide exceptional care for your animals in the Greeley, Windsor, Eaton, Evans, and the entire Northern Colorado area. Call us today at 970-351-0936 to schedule an appointment. Drs. 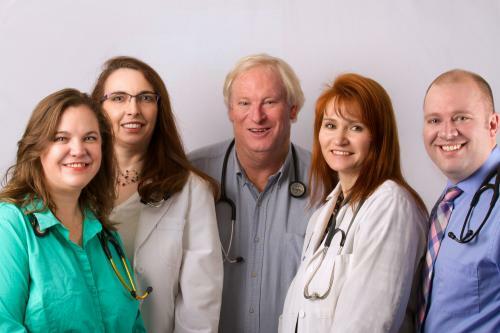 Roger Klingenberg , Stephanie Buchholtz, Carla Gabel, Merideth Early, Jordan Dewing, and Mindi Dosch at Sheep Draw Veterinary Hospital are some of the best vets in the Greeley, CO area and are committed to your pet's health and well being. Sheep Draw Veterinary Hospital excels in pet care and the science of veterinary medicine. Our Doctors and staff at Sheep Draw Veterinary Hospital have provided Greeley, Colorado with compassionate veterinary care and pet services year after year, making us the animal clinic of choice for pet owners in and around our community. Sheep Draw Veterinary Hospital offers the community the most advanced medical, surgical, and dental services. We also have an in-house pharmacy and access to specialists, making our veterinary facility a one stop shop for your pet's health and medical needs. If you are new to our website, please browse around to learn about our facility and to read interesting pet articles and watch groundbreaking pet videos. Click on the "email us" link below to ask us a question or to submit feedback. For directions to our office see our contact us page. To receive free monthly veterinary care articles, please subscribe to our newsletter.